Mike, Gareth and Joe have been working on a 3D scene which will be projected up on the wall, and which will respond in real-time to the Kinect data. The environment is built and runs in VVVV. Mike has created the particle stream (the spheres mentioned in the design which flow to / from the threshold). He found the CiantParticles patch early, because it pretty much just does what we wanted to do. CiantParticles move according to forces you specify with parameters, and they respond to other objects in the scene - in this case our Kinect skeletons. Alex, Barney and I have been making an responsive sound environment. The idea is that when people walk into the installation space, their 'skeleton' is assigned an instrument from the currently playing music track. As they move around, their movements control effects on that instrument only. When another person enters the space, they are assigned another instrument and each can continue to control their own instrument independently of each other, each person contributing to the overall sound. Tom and Hayden have been working on grabbing Kinect data, which is basically data about human movement, and sending it out across the network. The graphics server (an Alienware laptop) reads the data from the network and uses it to render an Augmented Reality scene, which is projected up on the wall. The Kinect is a very cool Microsoft device which was designed for the Xbox 360. It's great for mapping realistic human activity into a 3D model in realtime. It has two cameras onboard - one infrared camera for reading depth data, one webcam-style camera for getting a regular video image matrix. Yesterday was our first day in the space (Nutrecht). It's a huge empty warehouse building with a number of large empty spaces. When we arrived several other installations were in the process of being set up. It's very cold, and everyone is walking around with coats and scarves on. Music and random sounds keep kicking out from around the warehouse. I met the other collaborators first thing at the airport to come out here (most for the first time). Gareth Griffiths is organising and managing the team. Mike Wilson is preparing 3D meshes and objects to make up the scene, and Joseph Mounsey is working on the visualisation and dynamics of the augmented scene. It's actually quite an odd task we have set ourselves here. Rather than build an installation between three collaborators over eight days, we will be working as 8 collaborators over 3 days. It's a very quick project, but with a lot of people and large scope for the size. The theme of this year's Freemote festival is 'Threshold'. Based on an online conversation and a single meeting, the group have come up with an outline for the installation we are going to attempt. 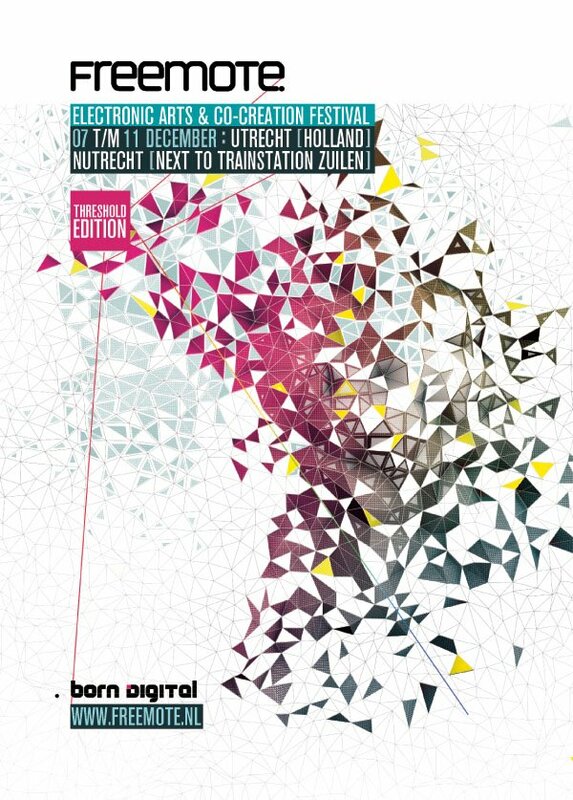 I've been invited to collaborate with V4W next week in Holland, at Freemote Electronic Arts festival in Utrecht. We'll be working on a multi-Kinect 3D augmented reality piece - a flyer has been posted here, should give you some idea. Once I get there I'll be blogging about the creation of the work and the festival overall, should be a great week! Here are some photos from previous year's events, and the space we'll be working with. Molly's poem dealt with the of passing time, of memories of the past and ideas about the future. One of the key ideas in the poem was the present moment's role as a dividing line between the two. You can read the poem in full here.